The first time I encountered the name of Khatia Buniatishvili was almost exactly four years ago in a concerto performance accompanied by Paavo Järvi. On that occasion she played Beethoven and I was hugely impressed although I see looking back that my feeling was that Jarvi was an attentive rather than inspired collaborator. In the intervening years, Buniatishvili's discography has grown fairly slowly but with the exception of Chopin's 2nd Concerto - again with Järvi - she has stuck with chamber and solo keyboard repertoire. So this is a valuable chance to hear her playing two of the most famous Romantic concerti with one of the world's great orchestras. Buniatishvili is a phenomenal technician - passagework of terrifying complexity is heard with extraordinary clarity. But she is much more than just a technician - for all the brilliance of her playing the passages from this disc that linger longest are the gently poised musings of each concerto's central movements. She has a beautifully artless simplicity when required which strips the music of any sense of sentimentality or archness. In this she is helped by Järvi's rather plain approach. I have to say too plain for my taste - my only other encounter with Järvi in Rachmaninoff was a good but not outstanding 2nd Symphony in Cincinnati. The best thing about this current disc is undoubtedly Buniatishvili's playing but the overall impact of the disc is severely hampered by a very average recording. It sounds as if some rather odd post-production choices have been made at the mixing desk. Primarily amongst these is the absolute primacy of the piano. The actual keyboard sound is good but mixed so front and prominent that even when playing passagework or 'accompanying' an orchestral tutti the piano writing is dominant. This is not the fault of Buniatishvili playing too loud simply a question of balance. The tonal quality given the Czech Philharmonic is something of a disappointment too. The recording has been made in the Dvořák hall of the Rudolfinum in Prague. Other engineers there too have struggled to control the resonance of a space which can often add blurring ambience without additional warmth. The Sony engineers have failed in this struggle leaving the Czech orchestra sounding unbalanced and not the world-class ensemble I have so often heard in the past. Balances between strings and wind are unconvincing with too distant horns and wiry thin-toned celli. Given that in the past Buniatishvili's performances in concert and on disc have prompted either adulation or derision in their individual musical choices this is a remarkably unfussy pair of performances. There are occasions when she can leap forward with impulsive and occasionally dizzying speed - the fugal passage in the 3rd movement of the 2nd concerto or the opening of No.3's finale are a case in point but generally she chooses remarkably centrist and uncontroversial speeds. Aside from the sudden bursts of speed the main defining characteristic is her refusal to over-egg the 'big tunes' with which these works overflow. Another way in which the engineering works against Buniatishvili is in the microscopic clarity her playing is given. Not that it cannot bear such close scrutiny rather that it can given an occasionally mechanistic quality to sections which need more of a sense of fantasy. As it happened I picked up recently the famous first recording by Ashkenazy on Decca legends of these two scores [conducted by Kondrashin and Fistoulari respectively]. I would not say these are my favourite versions but direct comparison is telling. Decca's ace production team of Erik Smith and Kenneth Wilkinson show their Sony counterparts how to balance this music even allowing for the fact that the Decca recording is over 50 years old. The older recording allows the listener to remember that Rachmaninoff was a master orchestrator - something the new disc rarely admits. More to the point Ashkenazy gives little if anything to Buniatishvili in purely technical terms but crucially he find a sense of quicksilver fantasy in passages which verge on the mechanistic here as recorded. Both Kondrashin and Fistoulari are far superior to Järvi in allowing the great arching phrases of Rachmaninoff to breath and expand. This does not mean indulgence but it does mean an elasticity that seems to be contrary to Järvi's aesthetic. One last comparison, the new recording is very roughly a minute faster in each of the six movements than the older one - and a full two minutes quicker in the Intermezzo movement of No.3. Not that in all fairness Buniatishvili ever feels at all rushed but again this is indicative of a refusal to indulge. One last point of interest to collectors; Buniatishvili plays the even more challenging "ossia" cadenza in the 1st movement of No.3 and it receives a mighty performance. I did wonder if Sony are trying to reposition Buniatishvili in the marketplace with this disc. The rather plain booklet features just a pair of rather demur pictures of the pianist with no artist biographies and none of the liner notes in the style of "artistic creeds" that have typified previous releases. For those who miss such things they can still be found on her website; "Khatia Buniatishvili, shining pianist at the height of her abilities, came into this world in a shower of light during the summer solstice. On a human level, she is attracted more to equinoxes, being smitten by justice and seeking day and night in equal share. By lifting one’s eyes skywards one might notice her playing hide-and-seek with either Venus or Mercury. The cosmos is her garden and it is in its movement that she feels alive, astride a comet" says the homepage. The liner is written/translated in a slightly florid way - it neither adds or detracts greatly from one's appreciation of the disc. 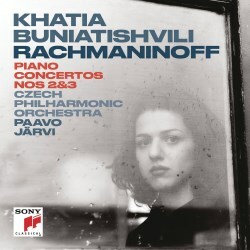 My admiration for Khatia Buniatishvili as a pianist and musician is undimmed but I must admit that this disc was less challenging or remarkable than I had been expecting. This is a generous but not uniquely generous coupling and it is entering an absurdly competitive field. For those needing to hear pianism of remarkable clarity in forensic sound this might well be a preferred option. I see that there is a videoed performance of No.3 available with Järvi père conducting which I have not heard but a comparison would be interesting. Clearly the two main performers have an enduring performing relationship built over several years so I am sorry that it seems not to have born compelling fruit here.